Hi. My name is Daniel Enriquez, Ranch Manager at White Fences Equestrian Center. Today I am writing this blog to start off a conversation, hopefully share my experiences and give you insight into the day to day at this beautiful facility. It is a great privilege to welcome you, readers, boarders, new clients and lesson students. Welcome to White Fences Equestrian Center! I was hired by the Speyers about a year ago. 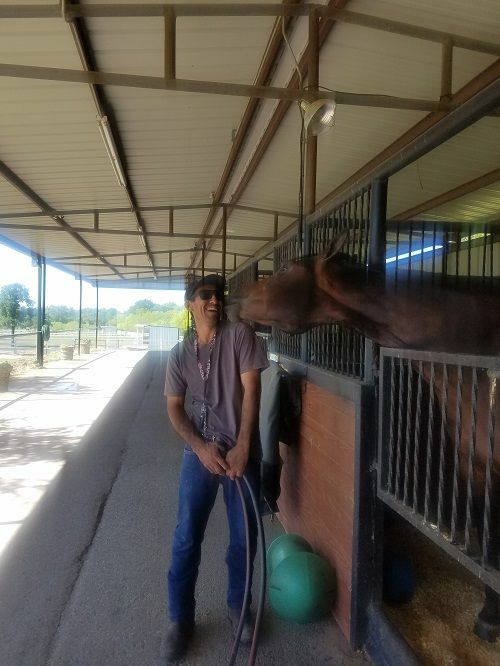 I had plenty of experience working at horse ranches and in spite of all my experience I firmly believe that each place is different, and each place has it's own rhythm and magic. Getting used to this rhythm, this magic as I call it, has taken some time to learn but has also bought with it a great deal of satisfaction. Every day at the ranch is a new experience and a new challenge. Each day we face these challenges in a positive manner in order to overcome them. I have a great team to work with, we not only work well together, but communicate well. Each person's effort is visible and at the same time seamless so that each client, visitor, friend and family member finds White Fences as a beautiful, peaceful and friendly place for both horse and human. A little about me and my background. I have always loved horses...at the tender age of 4 I had my first experience with a horse. I went on a ride...a ride that I am still on! At the age of 12, I started doing Charreria, the national sport of Mexico. I was fortunate enough to compete in the Charreria with many horses (it is a lottery draw as to what horse you get at the competition). It is very fast paced and exciting. As I grew up, I had the opportunity and the privilege to own, ride and care for my personal horses. At which point I dedicated my time along with a couple of friends to do trail rides. These were not one hour trail rides -- these were trail rides that consisted of going from city to city or town to town for days or even weeks at a time. At this point of the story, I'm sure you are wondering why I am telling you all of this? Well, during this time I acquired and obtained a lot knowledge about what a horse and rider need. It is a life journey, with my friend the horse that I ended up in this beautiful country. During my life time, the horse has been my friend, teacher, mentor and confidant. They have taught me many lessons both good and bad but the message stays they same -- they have taught me to be a better person. I love to teach people how to improve their communication with their horses. To understand their nature, their needs. By closely observing and being part of their life and meeting their physical and emotional needs they become more than than our best friend or partner; They become a part of you. This relationship, it's hard to explain or describe. Some of us are lucky to have experienced it, for others it's just right around the corner. If we are fortunate enough to get to that place -- that's where the magic lies. I am proud and and humbled to be able to work here and be able to work with all these wonderful people and horses. We are very committed with our daily tasks to ensure the horse at White Fences Equestrian Center are as comfortable and as pampered as possible. We feed high quality grains and hay and our processes and standards allow us to keep them healthy always ready for their next adventure. Thank you for reading this blog. Please know these are just my personal thoughts and opinions. Our doors are always open if you want to visit or just stop by. If you want to take your first lesson or your 5,000 lesson we are here for you. If you don't want to take lessons, own a horse, you can always come out and do a trail ride. Like I have always said - You don't have to ride like you dream, when you ride, it must feel like a dream. Come ride!! Thanks again!